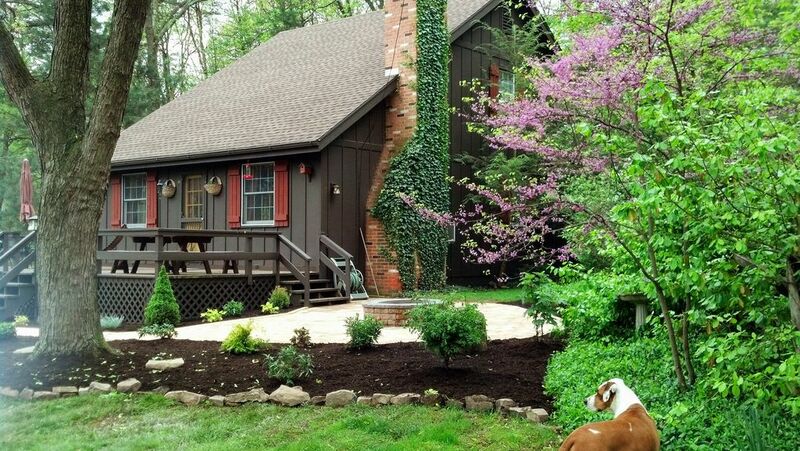 Quiet, rustic cozy home on wooded grounds, perfect for a relaxing getaway. We are 1 1/2 miles from James Creek boat launch near the center of Lake Raystown, located near Entriken. This home has two bedrooms, one on the first floor with a double bed, and the other, on the second floor, with two queen beds.. The second bedroom also sports an upright piano for the musical guest. Wi-Fi is available. Deck is furnished with outdoor tables, seating, and a gas grill. A fire ring is available off the deck for making s'mores and the ingredients are complimentary! Firewood is available for $10/wheelbarrow load. Plenty of bird-watching and chattering squirrels. See our tourist guide booklet for all kinds of fun things to do. Have a great time! Lake Raystown is the fishing and boating capital of central Pennsylvania and James Creek launch is a hot spot for bass tournaments. Five minutes from Lake Raystown Resort and Waterpark and Trough Creek State Park's Balanced Rock and Swinging Bridge, multiple hiking trails, and great trout fishing. Multiple geocaching opportunities in the area. 15 minutes from Seven Points Recreational Area and Marina and the Allegrippis biking trails. Guided fishing tours and lake beaches at Seven Points Recreational Area and Raystown Lake Resort. Great hunting in this area in the fall. The house is approximately 18 miles from Huntingdon , Juniata College , Lincoln Cavern. Blue Knob and Tussey Mountain Ski Resorts within 1 hour. Penn State University is also within an hours drive. Our family purchased acreage on Piney Ridge in 1971 to take advantage of the newly formed Raystown Lake, built a road, cleared the land, roasted many a hotdog over burning brush piles, and finally built the cottage in 1974. It has been the site of many reunions, a wedding, a few honeymoons, anniversary & birthday celebrations, and Thanksgiving dinner has been a tradition here since 1974. The cottage has been well used & well loved. We chose the spot for its proximity to the lake to take advantage of the many activities such as boating, skiing, swimming and fishing. We hope you enjoy it as much as we do! AC units on both floors. Turn off the air conditioning when leaving the house for any period of time. There are six steps to access the home. Fire Ring, toasting sticks, mountain pie makers, & complimentary fixings for s'mores. WiFi available. Piano, two Lazy-Boys for additional sleeping option. The neighbor's friendly dog will visit. Cute, quaint, peaceful and worth the trip! Took my 81 year old mother for a trip down Memory Lane since her family used to own land by the Raystown Branch of the Juniata River before it was dammed up for flood control. The house is what we expected and more. Next time, we won't bring as much, since the house is very well stocked -even a full sized washer and dryer! Loved the house and the deck outside was very nice. Got a chance to use the fire pit and I was glad it was paved for easier access. Enjoyed the complimentary s'mores with relatives. Many different birds and small animals visited, plus the neighbor's friendly dog (Julie even stocked doggie treats for her!). Very peaceful and quiet. Only 5 minutes away from the Lake Raystown Resort. Highly recommended! Excellent! Clean, cozy and comfortable!! Amazing Cabin in an Awesome Location! My husband and I rented this cabin for a weekend getaway to explore the Raystown Lake area. The cabin is exactly as described and presented in the pictures. It is so peaceful and the deck and landscape is gorgeous! The owners went above and beyond by providing bottled water and everything you need to make S'mores by campfire! The house is fully stocked including linens and towels. We brought our 2 dogs and they loved it too. They even had a friendly neighbor dog (Hallie) to play with. We loved it so much we hope to return next year! where the snacks are kept. Our stay was was short but great. The cabin is wonderful. A place to relax and make memories. Close to all that Raystown Lake area has to offer. The simmores are waiting for you. Evidence of smoking indoors will result in loss of security deposit.